Tax Deductible Registration fee of only $125 per person and includes all contests. Thursday June 23 from Noon to Late. 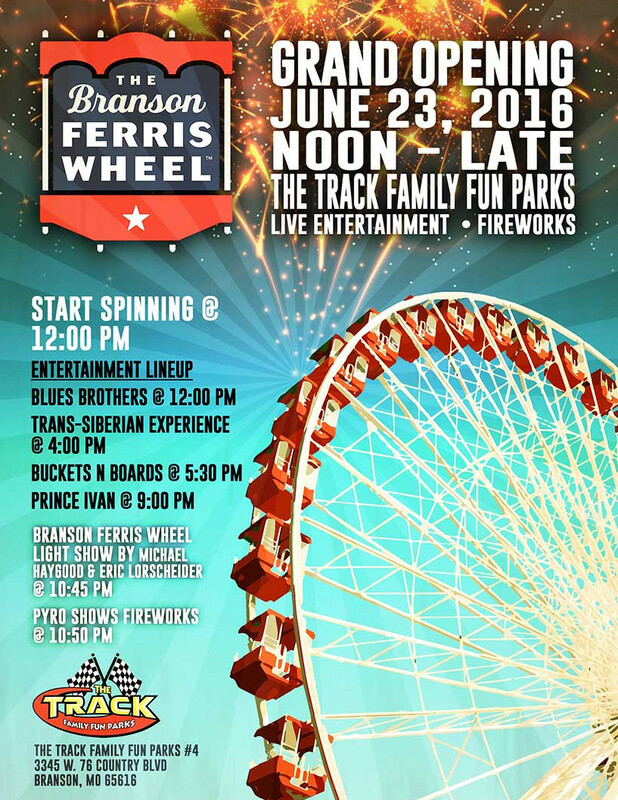 The big wheel starts spinning at 12:00 pm with entertainment throughout the day and into the evening. Wrapping up with a Ferris Wheel Light show and Pyro Shows Fireworks at 10:45 pm. (BRANSON, MO) — In an epic union of 21st century technology and classic music brilliance, the Branson Music City Centre opens the 2016 season with a rock opera in tribute to the world-famous Trans-Siberian Orchestra. The show, which raised its curtains at 7 p.m., Thursday, May 5, is poised to breathe fresh air into the Branson entertainment scene, alluring a younger audience and families. The theatre, redesigned with a “Digitally Immersive” technology, will be the first and only of its kind in the Branson area. The technology incorporates a jumbo 150-foot wide by 40-foot high digital projection set that is designed to play 180-degrees around the theatre, literally immersing the audience in scenes from the storylines that correspond with the music. The Immersion Theatre technology is the brainchild of Holoworx Productions. This theatre technology is only in 11 venues worldwide, two of those in the United States. Branson is one of them. Complimenting and launching the technology is the St. Louis group, Denial 3. 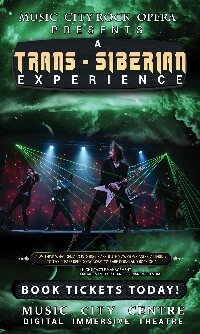 Touring as a Tribute to the Trans-Siberian Orchestra, Denial 3’s theatrical performances have been igniting stages nationwide for the last nine years. The founder and lead guitarist of Denial 3 has been endorsed by the Trans-Siberian Orchestra. Each year, across the nation, one event brings together entire communities to take part in the fight against cancer. That event is the American Cancer Society Relay For Life. It’s a time and place where people come to celebrate those who have survived cancer, remember those we’ve lost, and fight back against a disease that touches too many lives. It’s not just an opportunity to celebrate, remember, and fight back your involvement will help the American Cancer Society work toward a mission of eliminating cancer as major health issue and will support much-needed services in your community. Thanks in part to the donations from Relay For Life and other events, the Society is saving lives, helping those touched by cancer, and empowering people to fight this disease all over the world. Fun night for families! Food, Games, Monkey Moe’s 28 ft long obstacle course, chances to win airline tickets, SDC, Ride the Ducks, & Dixie Stampede Tickets. Wear your best overalls and come Join the Fight Against Cancer! LAS VEGAS, May 22, 2016 – The International Council of Shopping Centers (ICSC) has announced the winners of the 2016 U.S. MAXI Awards, highlighting the retail real estate industry’s most innovative events, programs and technologies that added value to shopping centers across the country. ICSC honored the winners during RECon, the global retail real estate convention in Las Vegas. Cause-Related Marketing Programs. 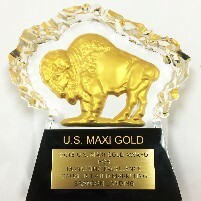 In addition, all ICSC U.S. MAXI Gold winners are automatically entered into the VIVA (Vision, Innovation, Value and Achievement) best-of-the-best prestigious global awards program honoring the most outstanding examples of shopping center design and development, sustainability, marketing and community service worldwide. Branson Landing’s School Shoes for Kids campaign is a community outreach program that provides school children in need with brand new shoes. New school shoes are collected at six (6) different Branson Landing Shoe Retailers on property and later donated to the local elementary, middle school and high school counselors for distribution among their students. 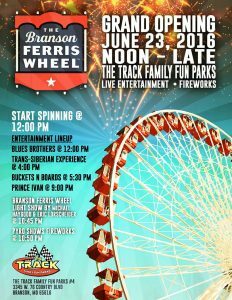 Local campaign partners were The Tracks Family Fun Parks, Andy’s Frozen Custard, Fox 5 KRBK-TV and BOTT Radio Network. The 2016 Traditional Marketing winners executed outstanding strategies across a number of subcategories including advertising, business-to-business, cause-related marketing, event and sales promotions, and public relations. The winners utilized myriad resources to re-energize their properties and support their respective communities.